Fourth Row Center: Film Writings by Jason Bailey: In Theaters: "The Messenger"
"I need men of solid stature," his colonel tells him. The job does not require him to be a grief counselor; in fact, engaging or showing emotion is discouraged. Their job is to deliver a message, and to do it in a timely fashion: they find the next of kin (or “NOK” in shorthand) and inform them that their child or their spouse has died in combat. That is the job. The Messenger is such an arrestingly simple idea for a film that it’s a little remarkable it hasn’t been done yet. We’ve seen the scene, in countless war pictures, where the mother, the father, the pregnant wife opens the door to see the two soldiers in their dress uniforms standing on the porch, wearing grave expressions. But who are those men? What is their life? Who would want to spend day after day riding, as one character calls it, “a tidal wave of grief”? 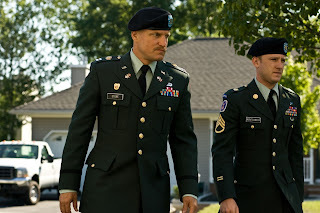 Staff Sergeant Will Montgomery (Ben Foster) certainly doesn’t want the job; he’s just back from overseas, where he barely made it out of a hairy firefight alive. But he has three months to go, and that’s his assignment; Captain Tony Stone (Woody Harrelson), a longtimer, will show him the ropes. Stone runs down the rules for him, and there are many: say “killed” or “death” instead of euphemisms like “no longer with us,” never talk to a neighbor or friend, stick to the script, don’t hug, don’t engage. Deliver the message, quickly and efficiently, and get out. But one visit, while he’s still learning the ropes, catches Montgomery off-guard. Olivia Pitterson (Samantha Morton) sees them coming, and heads them off—“How did he die?” They tell her, and she nods, and thanks them. She’s not emotional; in fact, she’s apologetic. “I know this can’t be easy for you,” she tells them. “Can you believe that?” Stone asks Montgomery on the way to the car. “That’s a first.” But something about the widow draws Montgomery back to her; he’s nursing a broken heart, badly, and he finds himself wanting to protect her, to comfort her. The broad strokes of the story make The Messenger sound like a treacly “love conquers all” tale, or a didactic anti-war treatise; it is neither. Co-writer/director Owen Moverman (whose screenplay credits include I’m Not There and Jesus’ Son), in his feature directorial debut, works in an off-hand, naturalistic style that keeps the film from feeling like the Lifetime movie it could so easily have become. The dialogue is direct and effective, imparting exposition without feeling like “expositional dialogue,” and the screenplay has a keen sense of exactly when to get in and when to get out of every scene. From an emotional standpoint, the picture doesn’t pull any punches—we see several of their visits to parents and spouses, and they are raw, emotional, and gut-wrenching. Moverman’s camera looks these scenes right in the eye and doesn’t flinch. In the first one, they are greeted at the door by the deceased’s girlfriend, clearly pregnant; oblivious, she invites them in to deliver the news to his mother (“she’ll be right back, she’s right down the street”), but the longer they wait, the more she suspects something is wrong, and the suspense and awkwardness of the scene is powerful (if discomforting). Those scenes are tough, but Moverman also doesn’t lay on any easy, extra sentimentality; there is no excess, in either the writing, the playing, or in Nathan Larson’s sparse score. Ben Foster is an actor who I resisted for quite some time; he seemed to have one character, a damaged emo kid, and I kept seeing it over and over in projects varying from The Punisher to Six Feet Under. But he won me over with his tightly-coiled performance in 2007’s 3:10 to Yuma; this film confirms that he is, indeed, an actor of real skill. He’s really underplaying here, to an almost risky degree, but it works—it’s a performance of fierce control, which makes his flashes of emotion more effective. Watch him closely in a difficult scene with Steve Buscemi as an angry father; he’s shot in a tight close-up, and the way the camera holds on his face makes the viewer search it for cracks in his façade. Harrelson is also first-rate, deftly maneuvering the complexities or his layered character (he seems, at first, to be a standard-issue by-the-books hardass, but turns out to be a good deal more interesting, and flawed, than that). Morton is understated and heartbreaking, giving a complicated, lived-in performance; it is she, in fact, who may benefit most from Moverman’s hands-off shooting strategy. He tends, in important scenes, to just let his actors go, playing scenes in long takes with minimal coverage, letting them work up a full head of emotional steam. He does it around the midway point, with a beautifully-realized scene in which the soldier and the widow’s flirtation comes to a head, playing the entire scene in an unbroken take that reframes rather than cuts, keeping the momentum and through-line of Morton’s stunning acting (and Foster’s able support). He does it again near the picture’s end, as Foster tells Harrelson about his last battle; Moverman’s camera pushes in slightly, but keeps Harrelson in the frame, and the result is shattering. The conflict between Stone’s routine and Montgomery’s emotion feels like the (rather obvious) construct that it is, and is barely bothered with and quickly abandoned; also, the subplot with Montgomery’s ex (an underused Jena Malone) is half-cocked, and feels somewhat phony and obligatory within the otherwise genuine film. Those are the complaints. They’re not much, from a big picture point of view. The Messenger is a deeply felt and powerful film, and contains some of the best acting I’ve seen this year. "The Messenger" is currently playing in limited release.